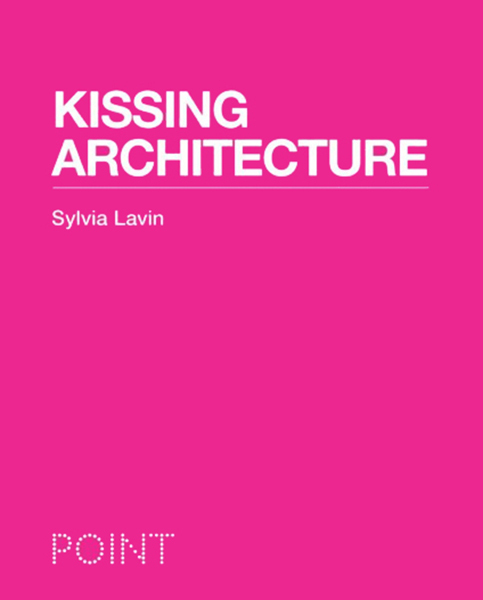 The cover of Sylvia Lavin’s 2011 book, Kissing Architecture. Image courtesy of Princeton University Press. Kissing Architecture, the first book in a new series called POINT: Essays on Architecture, is not for the chaste. Lavin writes for an audience already intimate with recent and contemporary architecture, art, and theory. The rewards of her slim book are, however, many as she jumps nimbly from artist Andy Warhol to design studio Diller Scofidio + Renfro to art critic Clement Greenberg to French philosopher Gilles Deluze in considering what she calls “superarchitecture,” a new kind of cultural project in which architecture is coupled with another medium to create time-sensitive environments. Kissing Architecture is itself a union of disparate and engaging materials. Bright pink, fabric-wrapped soft covers open to slick, glossy pages. 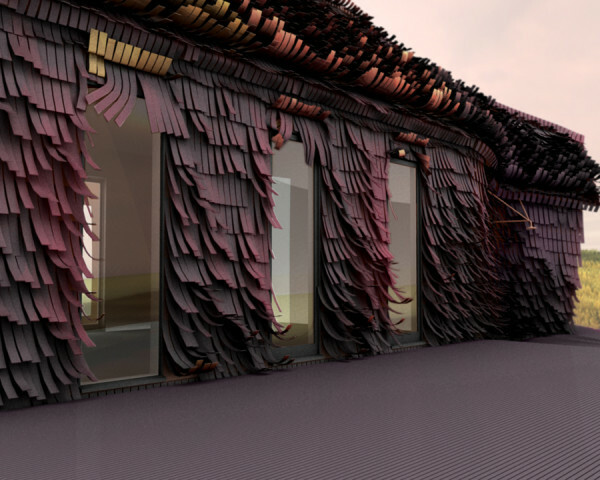 Sited at the intersection of art and architecture, Lavin’s writing can be connected to the scholarship of figures like Giuliana Bruno and Beatriz Colomina. Considering a variety of projects, Lavin, throughout the book, celebrates the value of vivid experience rather than just visual perception. She focuses especially on the smart pairing of architecture and video installations and on architects and artists engaging with the architectural façade, or surface, in sculptural ways. Swiss artist Pipilotti Rist’s Pour Your Body Out receives a lengthy discussion. This 2008-2009 installation aimed at, as Rist describes it, melting in and kissing Yoshio Taniguchi’s 2004 renovation of the Museum of Modern Art in New York. Through a combination of video projections, sound, carpet, and furniture, Rist brought sensuality and femininity to a space that has, for many other artists, proven cold and dwarfing. 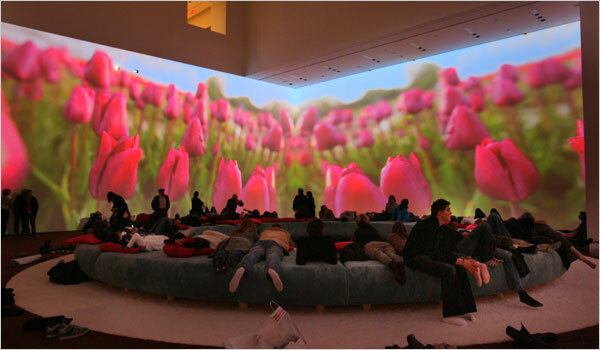 Pipilotti Rist’s Pour Your Body Out (7354 Cubic Meters) at the Museum of Modern Art, New York, 2008. Image courtesy of the New York Times. Raspberry Fields by Jason Payne for Hirsuta, Round Valley, Utah. Image courtesy of Hirsuta. Concluding her short volume, Lavin invokes the importance of politics and ethics in the entwining of art and architecture. But if sociopolitical motivations underlie her project, Lavin does not wear a heavy heart on her sleeve. She smartly keeps her writing light, playfully drawing out her extended analogy of kissing throughout the book’s four sections. If this is your first rendezvous with Lavin, I hope that she will soon become one of your steadies. In addition to her earlier publications, she has a forthcoming title, The Flash in the Pan and Other Forms of Architectural Contemporaneity. May you fall madly in love.